Alchemy Game. 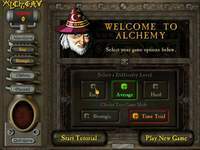 Download Alchemy game. Alchemy download. The object of the Alchemy game is to transform the entire board into gold by placing magic RUNES on every square. When you turn a whole board to gold, you will proceed to the next, where you earn more points but the game becomes more difficult. RUNES are magical symbols that come in different shapes and colors. You place these on the board to change the square underneath to gold. 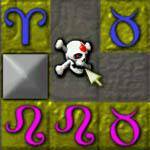 Runes must be placed next to an existing Rune, and they must match all adjacent Runes in either their shape, their color, or both. Play an awesome new version of the magical puzzle game - Alchemy! Save your high scores and upload them to the internet to compete with Alchemy players around the world! Spectacular new hi-res graphics make the magic come alive! New TIMETRIAL mode lets you challenge Alchemy in real time! All new level backgrounds and mystery gems!